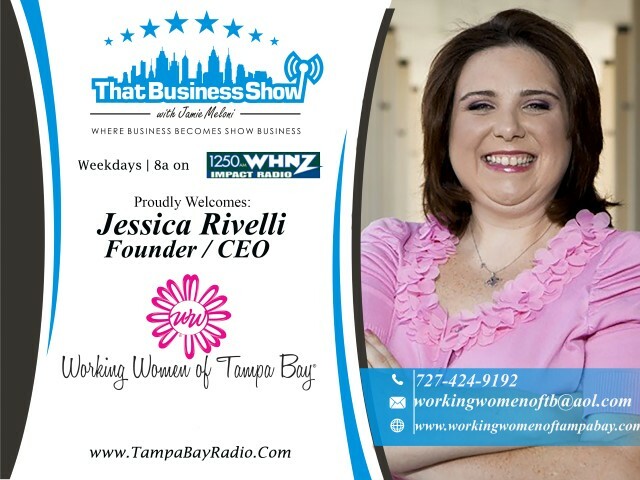 Working Women Wednesdays was featured today on #ThatBusinessShow – this is a weekly feature brought to us by the Working Women of Tampa Bay Networking Group and be sure to visit http://www.workingwomenoftampabay.com for information on their upcoming events and ways to get involved. Jessica Rivelli, CEO and Founder of the group, opened the show with an update of events they have on their calendar including an event with the U.S. Indo Chamber of Commerce on July 22nd at Jackson’s Bistro which is also the same day as the iHeart Radio Networking Mixer being held at the iHeart Building at 5pm. Also, early bird pricing for the Working Women Conference ends June 30th so be sure to pick up your tickets to that event which is being held Sept 10th and 11th at the Straz Center in Tampa. Learn more and get tickets at http://www.workingwomenconference.com! My 2nd guest on the show was The Entrepreneur’s Attorney, Sheryl Hunter. Sheryl has been representing business owners for the past 19 years and her Law Firm, Hunter Business Law, has 5 attorneys in Tampa specializing solely in Business Law. Services range from such topics as Corporate setup and guidance, contracts law, employment law, business succession planning, intellectual property and mergers and acquisitions. Sheryl shares some great tips on corporate structuring on this segment and we also touch on some basics of employment law such as the differences and need to know information regarding independent contractors vs. employees and the differences in exempt vs. non-exempt employees. Consider Sheryl a resource for your business and don’t make simple mistakes that can cost you dearly for failing to get some advice. Reach out to Sheryl today at http://www.hunterbusinesslaw.com or phone at 813-867-2640 / email is hunter@hunterbusinesslaw.com! On the 2nd half of the show, I spoke with Cindy Dervech, Owner of Breezin Entertainment and newly launched South Tampa Suites which for $29.99/month, she offers postal services including a drive up booth for postal pick up and office space for an office away from an office when you are in South Tampa. South Tampa Suites is located at 3711 W Swann Ave Tampa. Cindy and I also touched on her path to entrepreneurship which began 25 years ago with the launch of Breezin Entertainment which focused on entertainment venues. She quickly learned the ropes and added services and today is a full service event planning and entertainment planning company. She is available to assist you with bridal parties, corporate events and entertainment venues just to name a few and her company is licensed, bonded and insured, a State requirement of event planners that many people may not even be aware of. Learn more about Cindy’s businesses at http://www.southtampasuites.com and http://www.breezin.com and contact Cindy today for your next event – she can be reached at 813-348-4998 or email at cindy@breezin.com!